come true. To The United States of America, my second homeland, that I love and appreciate………..
And this is my story of how I made it, which was published in a magazine and a local newspaper. endless varieties is nearly overwhelming. Bangkok. Smiley was mesmerized by them. be taken for her to arrive where she is today. (who she had met at the university) also worked there. They made plans to someday marry. would be able to further her education. Unfortunately her English was not strong enough. do? Will I ever get anywhere? still there. You’re only a weed, and you have no choice but to give the world your beauty. savings, bought a car, and got a job at Disney World 'Epcot' Land Pavilion. house in Orlando. In 1998 their son Phil was born. but also to build a home for themselves and their son. greenhouse while the roof was being put on. They made it! nearly 100,000 plants under 20,000 sq. Ft. That has just about fulfilled Smiley’s dreams. sweetest of scents. 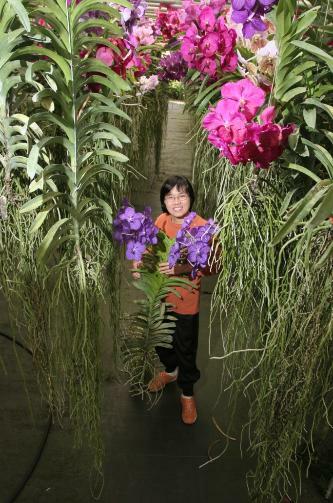 Others choose orchids that produce the biggest flowers. himself and has even gotten to keep whatever money comes from their sale. herself lucky and enjoys giving something to help others. told her, “Dream far and I’ll help you reach your dreams.” And he did.